Manijeh (Mani) Troutman is a contemporary artist residing in Bellingham, Washington. She is Persian born, growing up in Tabriz, Iran. While in Iran she graduated from medical school and completed her training as a specialist doctor. In 2007 along with her two sons she immigrated to Vancouver, BC. Three years ago she moved to Bellingham, WA. The beauty of the Northwest nature and enjoying life in peace and harmony gave her the creative inspiration she needed for her works of art. Mani was inspired by her father who was a self taught artist as well as from a Croatian-Canadian artist friend who discovered her talent and had a strong influence in encouraging her to develop her career in art. She has also benefited greatly from several workshops with local artists who have generously shared their skills and knowledge in creating wonderful works of art. 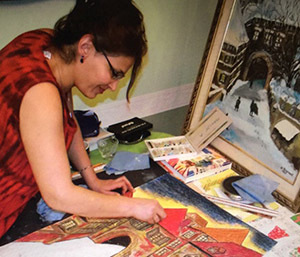 Mani enjoys pastel and acrylic painting as well as sometimes exploring mixed media for her creative arts. She has exhibited her art at the Samish Island Arts Festival and at various retail locations around Bellingham. This past spring she also had a very successful exhibition at the annual Cascade Cuts plant sale. Mani believes that in the inner child of everyone lies an artist and all we need to do is let that child comes out and plays. Painting brings her much joy and freedom and it is her wish to convey this joy in each of her works of art. It is her hope that viewing her art brings you joy and love as well. Thanks for viewing my art!